The Progress 18 spacecraft atop its Soyuz booster is raised up onto its launch pad at Baikonur Cosmodrome, Kazakhstan on June 15, 2005. The two-man crew livingaboard the International Space Station can look forward to receiving freshfood, more oxygen and new equipment Saturday night when an unpiloted resupplyship docks to the orbiting complex. 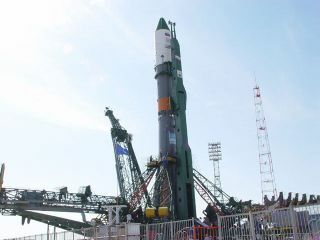 The Russian-made ProgressM-53 freighter was successfully launched into space at 2309 GMT (7:09 p.m. EDT)Thursday from Baikonur Cosmodrome, Kazakhstan. A three-stage Soyuz-Ubooster propelled the 24-foot long ship on a two-day, pre-scripted course thatculminates with an autonomous docking to the station's Zvezda service module'srear port around 0044 GMT (8:44 p.m. EDT) Saturday evening. An on-time dockingwould occur as the two craft soar 225 miles over Beijing, China. The Progess spacecraft,known in the station's assembly matrix as mission 18P, reached its preliminaryorbit about nine minutes after blastoff and separated from the Soyuz rocket'sspent third stage. Onboard commands unfurled communications and navigationantennas and deployed two power-generating solar arrays that span 35 feet. A series of precise enginefirings over the next two days will guide the Progress into the station's orbitfor the linkup. The Zvezda docking port was vacated Wednesday when the Progress17P mission, filled with garbage and unneeded hardware, pulled away from thestation and re-entered Earth's atmosphere. Thestation-bound Progress carries 4,662 pounds of supplies, including 116 Russianitems and 75 for NASA packed into the craft's cargo module. The "dry"cargo amounts to 3,097 pounds. The refueling module isloaded with 397 pounds of propellant for transfer into the Russian segment ofthe station to feed the outpost's maneuvering thrusters. The fuel is pumpedfrom Progess via connections in the docking port. Another hefty portion ofthe supply vessel's load is 926 pounds of water. To replenish the station'soxygen supply, the Progress is bringing 242 pounds of pressurized oxygen and 40additional solid-fuel oxygen generator cartridges. Ongoing breakdowns of theRussian Elektron oxygen-producing device on the station has forced the crew toburn two SFOG "candle" cartridges per day. Spare parts to assist inElektron repair efforts are aboard this Progress. Expedition 11 commanderSergei Krikalev and NASA science officer John Phillips are two months intotheir planned half-year mission aboard the station.